The Silenta-box is an In-line metal box fan with a centrifugal impeller and Blauberg motor, enclosed within a sound insulated galvanized steel casing for set-ups that require low noise levels. The Silenta-box fan features a 2 pole motor that is equipped with ball bearings for a longer service life. The motor is installed on purpose built vibration-damping mounts to absorb vibration and noise. 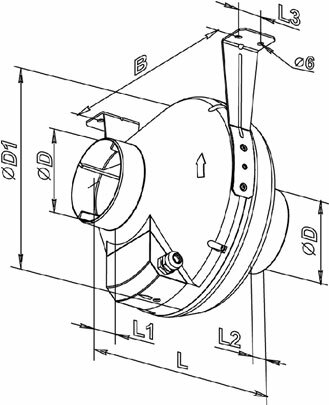 The centrifugal impeller with backward curved blades is dynamically balanced to ensure high airflow levels against resistances caused by long duct runs and carbon filters. Ideal for supply or extract ventilation, Silenta-box can be controlled by an external speed controller.